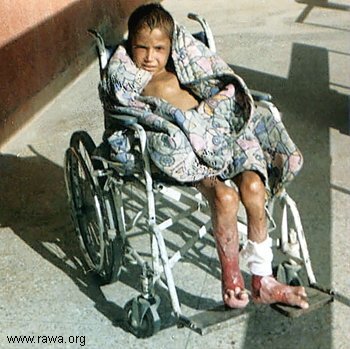 Mohammad Khan, 9 years old, son of Sher Afghan was wounded on Nov.11, 2001 when a US B52 war plane dropped bomb on Korang village of Surkhrod district in Nengrahar province, south of Afghanistan. He is suffering since past 3 years and due to poor health care facilities he never recovered from the painful wounds. The photo has been taken on Dec.12, 2004 when he was visiting a hospital in Jalalabad city.